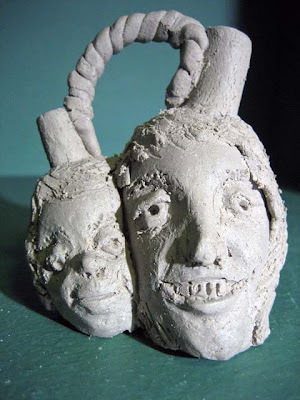 When my Art Salon met at my studio recently, I showed them all thirteen of the 2009 First Quarter’s Local Talkers, the small face jug series I am making based on photos from a weekly newspaper column. (Read my previous two posts for the complete backstory!) This mother-daughter double jug from Week 9 was quite a favorite of the group. It is the only double face jug and the only one of a child, at least so far, and it sure is sweet, even if I do say so myself. Anyhow, as you may see in the photo, the clay has been bisque-fired, but is waiting for decoration. It is pretty raw looking, but it sure lets the form of each piece be the star. Each one is a stand-alone sculpture. I think I have already mentioned that I plan to do the decorating early in 2010 when I have all 52 or 53 jugs together in a complete body of work. That is both a good and a bad thing. By decorating them all at once, there will be the same “hand” at work and the same kiln for the finish firing, creating unity in a subtle way. Always the possibility of breakage….but I will just deal with that if it happens by re-making it. Well, like I have said, I have never worked this way before and weekly am finding out new things. Know that I am also getting glimmers of how they all will be displayed to best effect…and I will probably talk about that in a future post, too. Somewhere in the past I read that artists are not so much problem solvers as they are problem seekers. It’s not by asking WHAT so much as by asking WHAT IF? that creates the itch to make art. To pose a personal “What If” is to seek out challenges. I like this problem which I have put before me. I like that is it just out of my control, just a little bigger than I can understand, that I must wait for it to reveal itself over time and yet has measured chunks of responsibilities for me to execute. It’s a fantastic way to live and has already made this year a memorable one. Can’t wait to see where it takes me!